With unique design, you can free your hands and walk, hike, camp, shopping, ride bicycles with your pets. 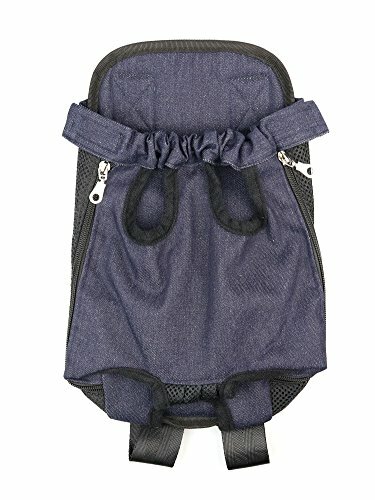 You and your pets will be comfortable in using this beautiful packsack, without pressure. This packsack can be worn in the front or at the back. High-quality denim is wear-resistant and durable. With sponge filling and canvas lining, your pets will be comfortable. Place your pets into the bag by opening the zip in the side and offer your pets enough space. In addition, a tail hole is designed at the bottom, so that your pets can flirt their tails. 1.Pet products do not have standardized sizes, please choose item according to your dog's inch of neck and chest, if you not sure which size fit for your dog, please freely contact us. 2.Since the item size is measured by hand, the size of the actual item could be slightly different from the size stated. Thanks for your understanding.